ONE of the distinctive features of a shrub is its appearance at the time of blooming. The sight is really pleasing to the eye. The year-round succession of blooms in various kinds of shrubs keep the garden colourful at one time or the other. Shrubs take to pruning very well and can be clipped back to any convenient height without affecting their flowering process. Strong fragrances also make some shrubs an attractive option. In some shrubs, even the foliage is extremely variegated and ornamental. In others, the appearance of seeds, pods or fruits makes them all the more attractive. Shrubs are a delight for ikebana freaks. The placement of shrubs in a garden has to be done with care. Almost all shrubs need a good amount of sunshine. If kept in the shade, their blooms are the first casualty and the overall growth too gets affected. In case more than one shrub is to be planted together, the colour combination of their blooms, their growing pattern, etc, should be kept in mind. Space permitting, groups of shrubs can be planned together. Else the focus can be on a single specimen. A shrub, if allowed to grow to a reasonable height, may also act as a divider in the garden. It may also be placed in a way that the area behind it can be used to advantage for growing shade-loving plants. This adds variety to the garden. Those living in the hilly temperate areas have the advantage of growing peonies, fuchsia, hydrangeas, rhododendrons, azaleas and abutilon. People in the plains grow galphimia, acacia, acalypha, allamanda, aphelandra, gulmohri, calliandra, raat ki rani, francisia, mussanenda, poinsettia, gardenia, hibiscus and many more varieties. However, I have seen some of the hill varieties like the hydrangeas being grown successfully in the gardens of some Chandigarh homes. Once planted, the shrubs do not need much care. The only thing to do is to keep theirgrowth under control. There is no set rule for pruning. The only thing to be kept in mind is the time of pruning, which is different for the various shrub species. It depends upon their time of flowering. Pruning at the wrong time can deprive us of their blooms. Such complaints are usually received from those growing bougainvilleas. There are, however, many species of bougainvillea that bloom in the fall and others that flower during summer. The pruning for such varieties has to be done roughly six months prior to the time of flowering. 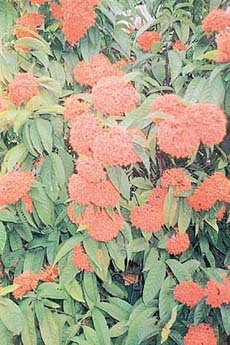 Most of the shrubs are easily available at local nurseries at very reasonable rates, around Rs 15 to Rs 20 a piece. In case you have seen some shrub, which is not available, you can multiply it yourself. For this you can contact one of the horticulture experts. In most of the cases, however, these are propagated from hardwood cuttings. Six to eight-inch long cuttings are made and a slant cut is given at the base. The cutting is then inserted in pure sand and placed in the shade, to be watered at least twice a day. It strikes root within a matter of few days. It can then be transplanted. In some cases even the terminal softwood cutting can be used e.g. in the case of gardenia, for which three to four-inch-long cuttings will do.